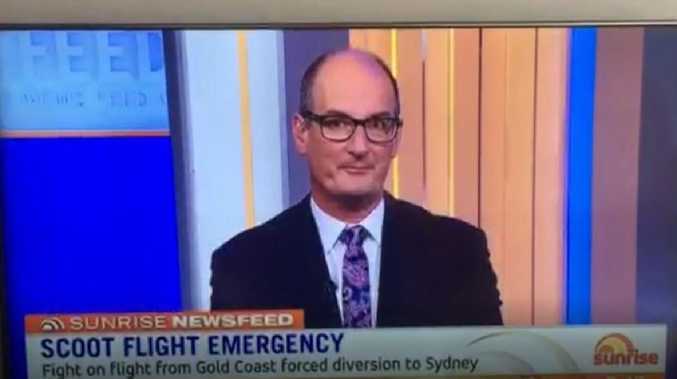 David ‘Kochie’ Koch's reaction after Gretel Killeen's on-air F-bomb. 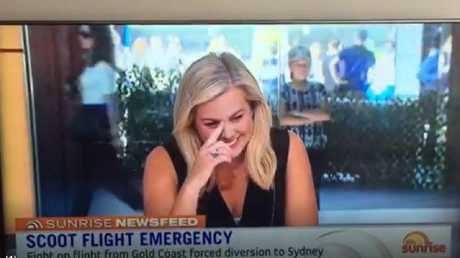 IT WAS meant to be a brief discussion about a serious news story, but an accidental F-bomb live on air had Sunrise stars in stitches. The former reality television host, author and media commentator Gretel Killeen was on Channel 7's hit breakfast show Sunrise this morning taking part in a panel discussion. Killeen was discussing the story of a Scoot flight from the Gold Coast to Singapore that was forced to turn back after a passenger started a mid-air fight. "It doesn't have to be budget flights - I've been on many flights where people have been pissed as newts," Killeen said, commenting on the incident, which was caught on camera. But it was while recounting some airborne annoyance she witnessed that things got a little, shall we say, excited. "In fact, I was on a budget flight, someone stood up during take off, 'I gotta do a f***ing piss'." Oops! Gretel Killeen after realised she just dropped an F-bomb on live morning television. 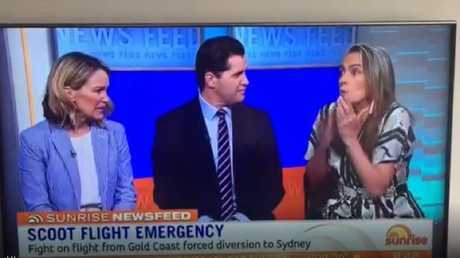 While imitating the inebriated passenger, Killeen realised a split second too late that she'd just dropped an F-bomb on live morning television. "Ooh, excuse me," she said, covering her face. "That's what he said. Just delete, delete (that)." 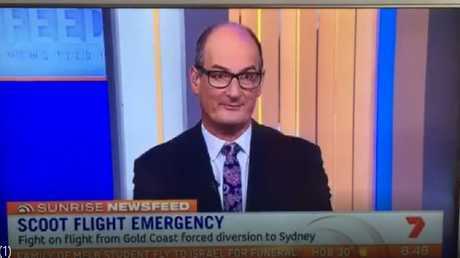 A bemused Sunrise co-host David Koch, whose face said it all, reminded her that "we can't delete, delete" while his counterpart Samantha Armytage struggled to keep it together. The show's executive producer Michael Pell told news.com.au the occasional unintended slip was part and parcel of operating in a live broadcast environment. "It's a good reminder we are absolutely live every single day," Mr Pell said. "No seven-second delay here. Anything can happen and frequently, it does. Apologies to anyone who was offended, although I have to confess, we found it quite funny." Sunrise co-host Samantha Armytage struggles to keep it together. Kochie's face kinda says it all. Going by the flood of social media commentary from viewers, the F-bomb didn't offend many. "Gretel Killeen saying 'I need a f***ing piss' on Sunrise has made me day. I'm off to the bottle shop to celebrate morning TV's high water mark," one Twitter user said, summing up the bulk of the reaction. "Thanks for the giggle while having my morning coffee," a viewer wrote on the show's Facebook page. Killeen, who is a staple of Australian media, was the long-running host of Big Brother on Channel 10 and is a critically acclaimed writer. Less than 20 minutes after taking off, a man became aggressive and started a fight with another passenger. 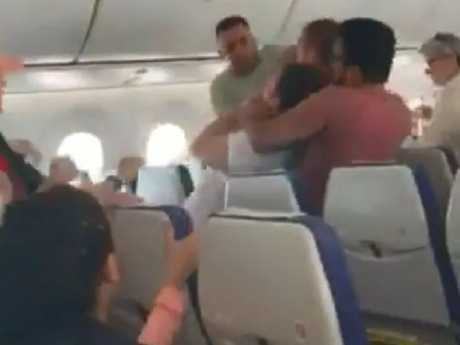 After taking his shirt off and lunging at another man, he was restrained until the flight made an emergency diversion to Sydney. He was detained by Australian Federal Police officers on the ground.